Spans are powerful markup objects that you can use to style text at a character or paragraph level. By attaching spans to text objects, you can change text in a variety of ways, including adding color, making the text clickable, scaling the text size, and drawing text in a customized way. Spans can also change TextPaint properties, draw on a Canvas, and even change text layout. Android provides several types of spans that cover a variety of common text styling patterns. You can also create your own spans to apply custom styling. If you aren't modifying the text or markup after creation, use SpannedString. If you need to attach a small number of spans to a single text object, and the text itself is read-only, use SpannableString. If you need to modify text after creation, and you need to attach spans to the text, use SpannableStringBuilder. If you need to attach a large number of spans to a text object, regardless of whether the text itself is read-only, use SpannableStringBuilder. All of these classes extend the Spanned interface. SpannableString and SpannableStringBuilder also extend the Spannable interface. To apply a span, call setSpan(Object _what_, int _start_, int _end_, int _flags_) on a Spannable object. The what parameter refers to the span to apply to the text, while the start and end parameters indicate the portion of the text to which to apply the span. After applying a span, if you insert text inside of the span boundaries, the span automatically expands to include the inserted text. When inserting text at the span boundaries—that is, at either the start or end indices—the flags parameter determines whether the span should expand to include the inserted text. 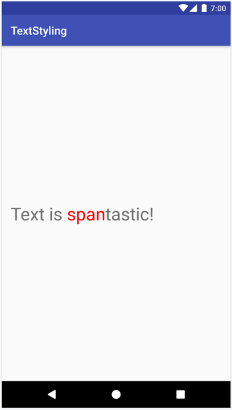 Use the Spannable.SPAN_EXCLUSIVE_INCLUSIVE flag to include inserted text, and use Spannable.SPAN_EXCLUSIVE_EXCLUSIVE to exclude the inserted text. Figure 1. Text styled with a ForegroundColorSpan. Figure 2. 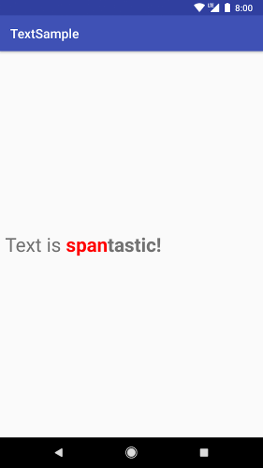 The span expands to include additional text when using Spannable.SPAN_EXCLUSIVE_INCLUSIVE. How the span affects text: a span can affect either text appearance or text metrics. Span scope: some spans can be applied to individual characters, while others must be applied to an entire paragraph. The sections below describe these categories in more detail. Spans can affect text appearance, such as changing text or background color and adding underlines or strikethroughts. All of these spans extend the CharacterStyle class. Spans that affect only text appearance trigger a redraw of the text without triggering a recalculation of the layout. These spans implement UpdateAppearance and extend CharacterStyle. CharacterStyle subclasses define how to draw text by providing access to update the TextPaint. Spans can also affect text metrics, such as line height and text size. All of these spans extend the MetricAffectingSpan class. Applying a span that affects text metrics causes an observing object to remeasure the text for correct layout and rendering—changing text size might cause words to appear on different lines, for example. Applying the span above triggers a remeasure, a recalculation of the text layout, and a redrawing of the text. These spans usually extend the MetricAffectingSpan class, which is an abstract class that allows subclasses to define how the span affects text measurement by providing access to the TextPaint. Since MetricAffectingSpan extends CharacterSpan, subclasses affect the appearance of the text at the character level. A span can affect text at a character level. For example, you can update character elements like background color, style, or size. Spans that affect individual characters extend the CharacterStyle class. A span can also affect text at a paragraph level, such as changing the alignment or the margin of the entire block of text. Spans that affect entire paragraphs implement ParagraphStyle. When using these spans, you must attach them to the entire paragraph, excluding the ending new line character. If you try to apply a paragraph span to something other than a whole paragraph, Android does not apply the span at all. Figure 8 shows how Android separates paragraphs in text. Figure 8. In Android, paragraphs end with a new line ('\n') character. Note that this example simply illustrates how to create a custom span. You can achieve the same effect by applying a RelativeSizeSpan and ForegroundColorSpan to the text. For more test examples, see MarkdownBuilderTest. Note: If you need to iterate through spans outside of testing, use nextSpanTransition() instead of getSpans(), as nextSpanTransition() is more performant. When testing spans, you should verify that the TextPaint contains the expected modifications and that the correct elements appear on your Canvas. For example, consider a custom span implementation that prepends a bullet point to some text. The bullet point has a specified size and color, and a gap exists between the left margin of the drawable area and the bullet point. See the implementation of these tests in the android-text sample. You can find more span tests in BulletPointSpanTest. There are several memory-efficient ways of setting text in a TextView, depending on your needs. When calling this overload of setText(), the TextView creates a copy of your Spannable as a SpannedString and keeps it in memory as a CharSequence. This means that your text and the spans are immutable, so when you need to update the text or the spans, you need to create a new Spannable object and call setText() again, which also triggers a re-measuring and re-drawing of the layout. In this example, because of the BufferType.SPANNABLE parameter, the TextView creates a SpannableString, and the CharSequence object kept by the TextView now has mutable markup and immutable text. To update the span, we can retrieve the text as a Spannable and then update the spans as needed. When you attach, detach, or reposition spans, the TextView automatically updates to reflect the change to the text. Note, however, that if you change an internal attribute of an existing span, you need to also call either invalidate() if making appearance-related changes or requestLayout() if making metric-related changes. In some cases, such as when using a RecyclerView.ViewHolder, you might want to reuse a TextView and set the text multiple times. By default, regardless of whether you set the BufferType, the TextView creates a copy of the CharSequence object and holds it in memory. This ensures that all TextView updates are intentional—you can't simply update the original CharSequence object to update the text. This means that every time you set new text, the TextView creates a new object. 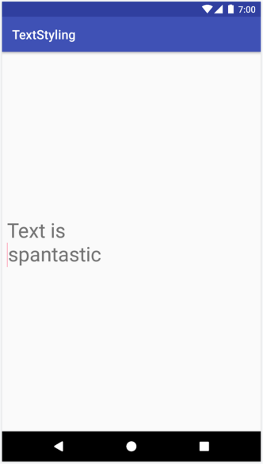 Note that you must use textView.setText(spannableObject, BufferType.SPANNABLE) when setting the text. Otherwise, the source CharSequence is created as a Spanned instance and cannot be cast to Spannable, causing newSpannable() to throw a ClassCastException. Be sure to set the Spannable.Factory object once right after you get a reference to your TextView. If you’re using a RecyclerView, set the Factory object when you first inflate your views. This avoids extra object creation when your RecyclerView binds a new item to your ViewHolder. If you need to change only an internal attribute of a mutable span, such as the bullet color in a custom bullet span, you can avoid the overhead from calling setText() multiple times by keeping a reference to the span as it's created. When you need to modify the span, you can modify the reference and then call either invalidate() or requestLayout() on the TextView, depending on the type of attribute that you changed. Android KTX also contains extension functions that make working with spans even easier. To learn more, see the documentation for the androidx.core.text package.